BATON ROUGE – As early as February 2013, University of Louisiana System institutions will begin accepting applications for the Bachelor of Arts in Organizational Leadership, a 100% online degree offered jointly by nine public universities. The accelerated degree completion program is designed for adults who stopped out of college. “According to the 2009 American Community Survey there are over 600,000 adults in Louisiana with some college credit and no degree. This pioneering program is a way to reach out to that market and entice former students to finish their degrees, while capitalizing on the unique strengths of nine public universities,” said UL System Interim President Tom Layzell. The Board of Supervisors for the University of Louisiana System today approved an agreement signed by the presidents of all nine universities to share faculty, staff, technology, and other resources in the online collaborative program. The degree will consist of 30 hours of courses offered jointly by faculty at the nine universities and 30 hours of concentration and elective courses offered by each institution. The online platform will be seamless and the cost will be uniform across concentrations and universities. To enter the program, students must be at least 25 years old and have completed 60 hours of college credit including general education courses. However, students with less than 60 hours will have opportunities to earn credit online or through prior learning assessment that gauges skills learned on the job. Offered in five, eight-week terms each year, and charging a flat per credit hour rate of $325, the program can be completed in two years well below the cost of other online degree programs. “We can offer a competitive price for the program because our universities are willing to share resources. Their faculty and staff are working together in unprecedented ways and the result will be a cost-effective, flexible degree for Louisiana’s working adults,” said Layzell. “Although applications will not be open until February, people interested in this program should begin researching their options including tracking down transcripts,” said UL System Vice President for Research and Performance Assessment Beatrice Baldwin who is coordinating the program. 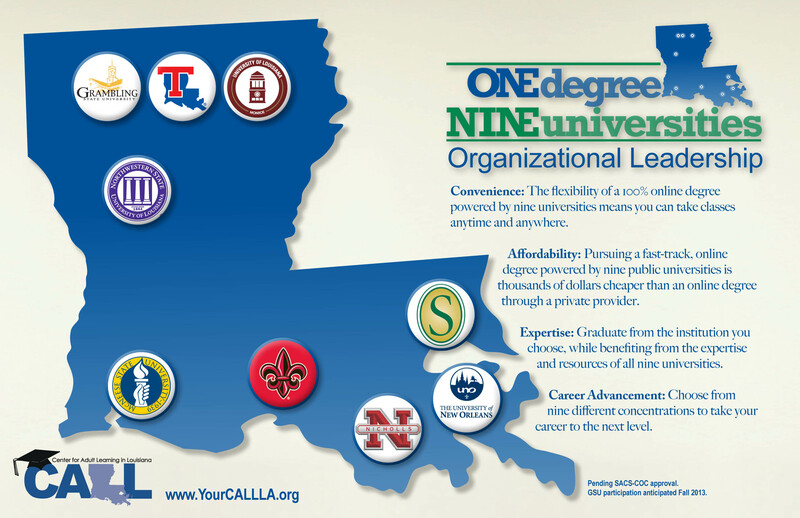 The UL System has been working with the Center for Adult Learning in Louisiana (CALL), sponsored by the Board of Regents, to structure and market the program starting in 2013. The program will join CALL’s 20 online programs for adults, although this will be the first collaborative degree of its kind. For more about online degrees for adults and the Bachelor of Arts in Organizational Leadership, visit www.YourCALLla.org and www.ulsystem.edu/ONEdegreeNINEuniversities. ABOUT THE PROGRAM AUTHORIZATION: The Bachelor of Arts in Organizational Leadership degree program has been approved by the Board of Supervisors for the University of Louisiana System and the Louisiana Board of Regents. It is pending approval by the Southern Association of State Colleges and Universities (SACS-COC) in December. Grambling State University’s participation is expected in Fall 2013.